The Argonaut Ensemble perform Alexander Schubert’s Superimpose Cycle. Photo by Jason Tavener. “Splits between real and faked instruments; a hyperactive zapping through styles and stereotypes” is how Hamburg composer Alexander Schubert describes his 2011 Superimpose Cycle for Jazz Quartet and Electronics. 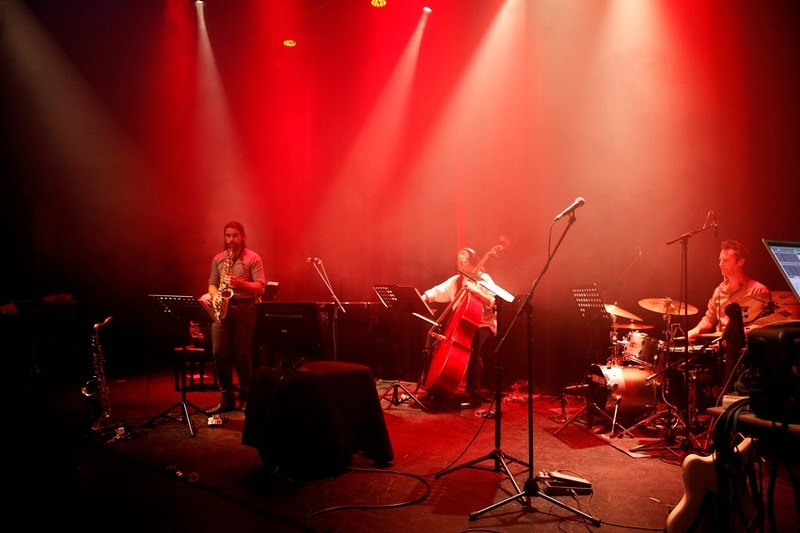 This whimsical idea was energetically realised in the work’s Australian premiere by the Argonaut Ensemble, comprising a hybrid instrumentation of piano, saxophone, violin, double bass, electric guitar, drums and electronics. Both the audience and musicians were seated on the dimly lit stage of Bendigo’s Capital Theatre, immersed in a hazy space that became home to disfigured saxophone solos, hammered piano notes and wailing guitar glissandi. Schubert creates a dense and unpredictable cross-genre sensation by mixing traditional composition elements with the impulsive spontaneity of jazz and electronics. The musicians in Superimpose Cycle were guided by in-ear click tracks—quite a contrast to typical jazz gigs where performers are often reliant on eye contact and gesture to achieve cohesiveness. Even though the individualised click tracks created the appearance of a detached ensemble, the seven musicians maintained a palpable sense of joyous unity. Saxophonist Joshua Hyde and pianist Emil Holmström thundered vigorously through demanding passages of repeated notes, with minimal signalling and absolute synchronicity. In the second movement, ‘Night of the Living Dead’, Anita Hustas explored the timbral possibilities of amplified double bass by alternating quick pizzicato stabs with weighty bowed tones, her smooth glissandos juxtaposed with electronics that bubbled with tension. Drummer Phil Collings joined in with a laidback jazz rhythm before launching into the complex patterns that propelled the work. ‘Infinite Jest’ exploded with a frenzy of crashing electronic waves that were initially a little confronting. As the floor rumbled with shuddering pulses, this density soon enveloped the audience in a cocoon of sonic experimentalism. Roaring and gnarly chords were driven to the forefront of this wall of sound by electric guitarist Kobe Van Cauwenberghe. The evolving interplay between the live acoustic instruments and processed electronics was particularly intriguing. In the earlier movements, stuttering sound samples were interspersed with instrumental figures in a back-and-forth manner, like the musical equivalent of a tennis match. This divide became gradually less distinctive as the electronics instead distorted the real-time performance with reverb and effects. Schubert wrote a series of computer processers to align with the timing sequence of the click track, so that new sound effects are implemented and withdrawn as the musicians reach certain points in the score. Heavily amplified violin featured in ‘Sugar, Maths and Whips’ with audible bow changes of a gritty, textural quality. Violinist Winnie Huang coped exceptionally with an unintentional technology glitch as the violin’s notes echoed in the sound system after a second of delay. Electronic musician Myles Mumford was on stage to control the running of the pre-programmed processors, and he explained afterwards that the unexpected delay was due to a processer adding latency where there should have been none. Although this was a computer error, it also became a functional musical feature that unknowingly embodied Schubert’s philosophy of there being little distinction between scripted sounds and indeterminate happenings. To superimpose is to place one thing over another so that both items are still evident and identifiable. The Argonaut Ensemble achieved this by balancing myriad diverse sounds and textures as though they were coloured panes in a kaleidoscope. Beautiful textural patterns constantly rotated to create shifting overlaps of colour and sound in a thrilling performance of vibrant musicality.